It's a month later than expected, but I can now say that the time is finally upon us. 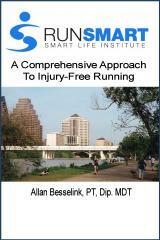 May 1, 2008 is the official release date for the first edition of "RunSmart: A Comprehensive Approach to Injury-Free Running". The paperback version is now available on this site and directly at www.lulu.com/content/2410779. It is also now available at select local retailers including South Congress Athletic Club. A special edition hardcover version is also available at www.lulu.com/content/2410751. Also of note: the official release party will be held Saturday May 17 at 7:00 pm at South Congress Athletic Club, the home of the Smart Life Institute (1109-B South Congress Avenue, Austin). Parking is on Music Lane behind the SoCo Center. Copies of the book will be available at this time. Should you not be able to attend, there will be a live video stream direct from the event which will be broadcast on this site (7:00 pm central time).